We live in an era of online purchasing with rapid delivery to your door with the use of drones, robotic technology, and GPS mapping. All of these forms of technology enable you to have purchases in your hands within minutes or hours. What technology existed in the 1920s to get letters and packages across the U.S. to your door? An answer to that lies in a farm field in Cottage Grove and on top of Indian Mounds Park in St. Paul. An unmistakable concrete arrow exists next to an old farm, and a 110-foot steel tower sits along the high bluff of the Mississippi River. These structures were part of the U.S. Postal Service’s ground-based navigation beacon system extending from New York to San Francisco that was constructed in the late 1920s. The system originally consisted of 1,500 airmail beacons. 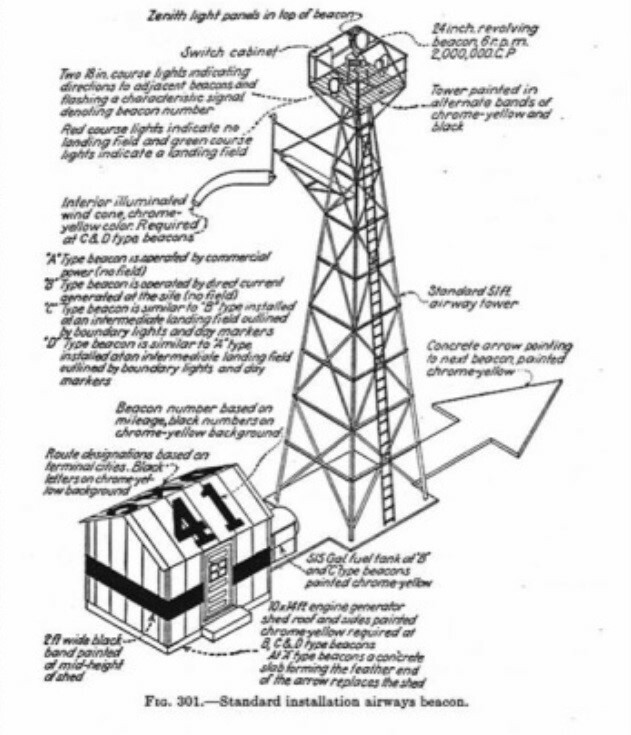 The beacons typically featured a 50-foot tower with rotating lights placed on top of a concrete foundation in the shape of a giant arrow measuring between 50 to 70 feet long. To increase the visibility of the concrete arrows, they were painted bright yellow. These structures enabled the U.S. 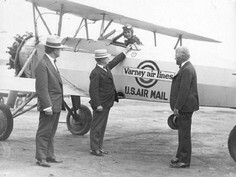 Postal Service to utilize planes to transport the mail across the country. The beacons and arrows were used to guide pilots to the airfields for the delivery of mail. In 1926, the management of the beacon system was turned over to the Department of Commerce. The airmail beacon program would remain in effect until 1933 when technological advancements and the economic constraints of the Great Depression brought the program to an end. Only two structures are left in Minnesota from the airmail delivery system. 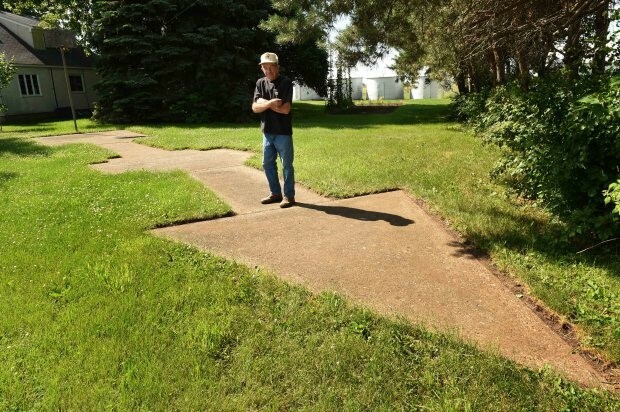 They are the concrete arrow on 90th Street in Cottage Grove, which was part of Beacon 33, and the tower in Indian Mounds Park in St. Paul. These two structures were part of the system that guided the pilots into Holman Field in St. Paul from Chicago. This technology enabled the fast delivery of mail, a big step up from the Pony Express that was soon obsolete. As we continue to witness the ever-evolving technology that brings items to our doors faster and faster, we remember a piece of history that started it all. Divine, Mary. “Looking for St. Paul? Look for the giant arrow in Cottage Grove” Pioneer Press 7 July 2017. Photograph by Scott Takushi of concrete arrow in Cottage Grove.